CHANHASSEN, Minn. (April 17, 2014) —Life Time –The Healthy Way of Life Company (NYSE: LTM), today announced the BUILT WITH CHOCOLATE MILK™ campaign as the official refuel beverage of select athletic events and in club programs at Life Time. The program will educate members and Life Time Athletic Event participants on the post-exercise recovery benefits of chocolate milk. Trusted by athletes and backed by science, chocolate milk helps individuals achieve their workout goals by helping them to recover after a tough workout. More than 20 scientific studies including athletes from sports spanning running, cycling and soccer support the advantages of drinking chocolate milk after strenuous exercise. As part of a regular recovery routine, it is an ideal way to help athletes refuel, rebuild and reshape, with high quality protein scientifically shown to help repair and rebuild muscles. Those participating in the BUILT WITH CHOCOLATE MILK™ Studio Cycle Classes, the Life Time Cycle Club, the Athleta Esprit de She women’s race series and the Leadville Trail 100 Mountain Bike events will experience the benefits of chocolate milk and help them stay motivated and finish strong. Lowfat chocolate milk contains the right mix of carbohydrates and protein scientifically shown to restore muscles quickly to their peak potential and helps replenish what the body has lost following a workout–including fluids and critical nutrients lost in sweat. For more information, visit gotchocolatemilk.com. To learn more about Life Time, visit lifetimefitness.com or facebook.com/lifetimefitness. The Milk Processor Education Program (MilkPEP), Washington, D.C., is funded by the nation’s milk processors, who are committed to increasing fluid milk consumption. The National Fluid Milk Processor Promotion Board, through MilkPEP, runs the BUILT WITH CHOCOLATE MILK™ Campaign, a multi-faceted program designed to educate athletes about the recovery benefits of lowfat chocolate milk after strenuous exercise. Lowfat chocolate milk helps athletes refuel, rebuild and reshape after regular exercise – with high quality protein scientifically shown to help repair and rebuild muscles. 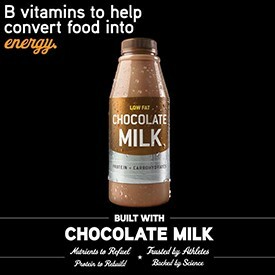 For more information, go to www.gotchocolatemilk.com. As The Healthy Way of Life Company, Life Time Fitness (NYSE:LTM) helps organizations, communities and individuals achieve their total health objectives, athletic aspirations and fitness goals by engaging in their areas of interest — or discovering new passions — both inside and outside of Life Time’s distinctive and large sports, professional fitness, family recreation and spa destinations, most of which operate 24 hours a day, seven days a week. The Company’s Healthy Way of Life approach enables customers to achieve this by providing the best programs, people and places of uncompromising quality and value. As of April 17, 2014, the Company operated 109 centers under the LIFE TIME FITNESS® and LIFE TIME ATHLETIC® brands in the United States and Canada. Additional information about Life Time centers, programs and services is available at lifetimefitness.com.